Captopril (rINN) is an angiotensin-converting enzyme (ACE) inhibitor used for the treatment of hypertension and some types of congestive heart failure. Captopril was the first ACE inhibitor developed and was considered a breakthrough both because of its novel mechanism of action and also because of the revolutionary development process. Captopril was discovered and developed at Squibb and Sons Pharmaceuticals based on concepts pioneered by Nobel Laureate John Vane and is now marketed by Bristol-Myers Squibb under the trade name Capoten. Additionally, it has shown mood-elevating properties in some patients. This is consistent with the observation that animal screening models indicate putative antidepressant activity for this compound, although one study has been negative. Formal clinical trials in depressed patients have not been reported. It has also been investigated for use in the treatment of cancer. Captopril was developed in 1975 by three researchers at the U.S. drug company Squibb (now Bristol-Myers Squibb): Miguel Ondetti, Bernard Rubin, and David Cushman. Squibb filed for U.S. patent protection on the drug in February 1976 and U.S. Patent 4,046,889 was granted in September 1977. The development of captopril was among the earliest successes of the revolutionary concept of ligand-based drug design. The renin-angiontensin-aldosterone system had been extensively studied in the mid-20th century, and this system presented several opportune targets in the development of novel treatments for hypertension. The first two targets that were attempted were renin and ACE. Captopril was the culmination of efforts by Squibb's laboratories to develop an ACE inhibitor. Ondetti, Cushman, and colleagues built on work that had been done in the 1960s by a team of researchers led by John Vane at the Royal College of Surgeons of England. The first breakthrough was made by Kevin K.F. Ng in 1967, when he found the conversion of angiotensin I to angiotensin II took place in the pulmonary circulation instead of in the plasma. In contrast, Sergio Ferreira found bradykinin disappeared in its passage through the pulmonary circulation. 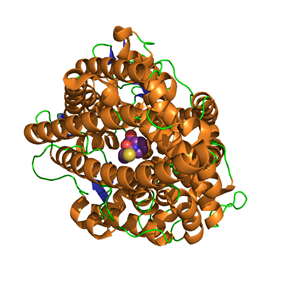 The conversion of angiotensin I to angiotensin II and the inactivation of bradykinin were thought to be mediated by the same enzyme. In 1970, using bradykinin potentiating factor (BPF) provided by Sergio Ferreira, Ng and Vane found the conversion of angiotensin I to angiotensin II was inhibited during its passage through the pulmonary circulation. BPF was later found to be a peptide in the venom of a lancehead viper (Bothrops jararaca), which was a “collected-product inhibitor” of the converting enzyme. Captopril was developed from this peptide after it was found via QSAR-based modification that the terminal sulfhydryl moiety of the peptide provided a high potency of ACE inhibition. Captopril gained FDA approval on April 6, 1981. The drug became a generic medicine in the U.S. in February 1996, when the market exclusivity held by Bristol-Myers Squibb for captopril expired. The development of captopril has been claimed as an instance of 'biopiracy' (commercialization of traditional medicines), since no benefits have flowed back to the indigenous Brazilian tribe who first used pit viper venom as an arrowhead poison. 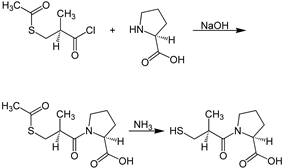 A chemical synthesis of captopril by treatment of L-proline with (2S)-3-acetylthio-2-methylpropanoyl chloride under basic conditions (NaOH), followed by aminolysis of the protective acetyl group to unmask the drug's free thiol, is depicted in the figure at right. Captopril synthesis of Shimazaki, Watanabe, et al. Procedure 2 taken out of patent US4105776. See examples 28, 29a and 36. Unlike the majority of ACE inhibitors, captopril is not administered as a prodrug (the only other being lisinopril). About 70% of orally administered captopril is absorbed. Bioavailability is reduced by presence of food in stomach. It is partly metabolised and partly excreted unchanged in urine. The adverse drug reaction (ADR) profile of captopril is similar to other ACE inhibitors, with cough being the most common ADR. However, captopril is also commonly associated with rash and taste disturbances (metallic or loss of taste), which are attributed to the unique thiol moiety. Captopril also has a relatively poor pharmacokinetic profile. The short half-life necessitates two or three times per day dosing, which may reduce patient compliance. The adverse effect and pharmacokinetic limitations of captopril stimulated the development of enalapril and subsequent ACE inhibitors. These were specifically designed to lack the sulfhydryl moiety believed to be responsible for rash and taste disturbance. Most subsequent ACE inhibitors are given as prodrugs, to improve oral bioavailability. All have longer half-lives and are given once or twice daily, which may improve patient compliance. Captopril (as other ACE inhibitors) overdose can be antagonized with naloxone. ^ Bryan, Jenny (2009). "From snake venom to ACE inhibitor the discovery and rise of captopril". Pharmaceutical Journal. Retrieved 2015-01-08. ^ Akif, M.; Georgiadis, D.; Mahajan, A.; Dive, V.; Sturrock, E. D.; Isaac, R. E.; Acharya, K. R. (2010). "High-Resolution Crystal Structures of Drosophila melanogaster Angiotensin-Converting Enzyme in Complex with Novel Inhibitors and Antihypertensive Drugs". Journal of Molecular Biology 400 (3): 502–517. ^ Attoub S; Gaben AM; Al-Salam S; et al. (September 2008). "Captopril as a potential inhibitor of lung tumor growth and metastasis". Ann. N. Y. Acad. Sci. 1138: 65–72. ^ Ng KKF and Vane JR: Conversion of angiotensin I to angiotensin II. Nature 1967, 216, 762-766. ^ Ng KKF and Vane JR: Fate of angiotensin I in the circulation. Nature, 1968, 218, 144-150. ^ Ng KKF and Vane JR: Some properties of angiotensin converting enzyme in the lung in vivo. Nature, 1970, 225, 1142-1144. ^ Ferreira SH and Vane JR: The disappearance of bradykinin and eledoisin in the circulation and vascular beds of the cat. Br. J. Pharm. Chemother.,1967,30, 417-424. ^ Smith CG, Vane JR (May 2003). "The discovery of captopril". FASEB J. 17 (8): 788–9. ^ Shimazaki, M.; Hasegawa, J.; Kan, K.; Nomura, K.; Nose, Y.; Kondo, H.; Ohashi, T.; Watanabe, K. (1982). "Synthesis of captopril starting from an optically active .BETA.-hydroxy acid". Chem. Pharm. Bull. 30 (9): 3139–3146. ^ M. A. Ondetti, D. W. Cushman, DE 2703828 ; eidem, U.S. Patent 4,046,889 and U.S. Patent 4,105,776 (1977, 1977, 1978 all to Squibb). ^ Brown, NJ; Vaughan, DE (1998). "Angiotensin-converting enzyme inhibitors". Circulation 97 (14): 1411–20. ^ Duchin, KL; McKinstry, DN; Cohen, AI; Migdalof, BH (1988). "Pharmacokinetics of captopril in healthy subjects and in patients with cardiovascular diseases". Clinical pharmacokinetics 14 (4): 241–59. ^ Atkinson, AB; Robertson, JI (1979). "Captopril in the treatment of clinical hypertension and cardiac failure". Lancet 2 (8147): 836–9. ^ Patchett, AA; Harris, E; Tristram, EW; Wyvratt, MJ; Wu, MT; Taub, D; Peterson, ER; Ikeler, TJ; Ten Broeke, J; Payne, L. G.; Ondeyka, D. L.; Thorsett, E. D.; Greenlee, W. J.; Lohr, N. S.; Hoffsommer, R. D.; Joshua, H.; Ruyle, W. V.; Rothrock, J. W.; Aster, S. D.; Maycock, A. L.; Robinson, F. M.; Hirschmann, R.; Sweet, C. S.; Ulm, E. H.; Gross, D. M.; Vassil, T. C.; Stone, C. A. (1980). "A new class of angiotensin-converting enzyme inhibitors". Nature 288 (5788): 280–3. ^ "Captopril (ACE inhibitor): side effects". lifehugger. 07-09-2008. Retrieved 2009-05-02. ^ Goldfrank's toxicologic emergencies, Lewis R. Goldfrank,Neal Flomenbaum, page 953. ^ Meyler's Side Effects of Analgesics and Anti-inflammatory Drugs, Jeffrey K. Aronson, page 120. ^ Ajayi, A A (1985). "Effect of naloxone on the actions of captopril". Clin Pharmacol Ther 38 (5): 560–565.